Today as I biked down Lincoln Road the temperature on the tower at Washington and Lincoln read 49 degrees. Even though it's not beach weather today I'm interviewing swimwear designer Red Carter for a fashion profile in MiamiArtZine. One of Red's swimsuits appears on the new cover for the Victoria's Secret Catalogue. Check out his fashions at http://www.redcarter.com/. 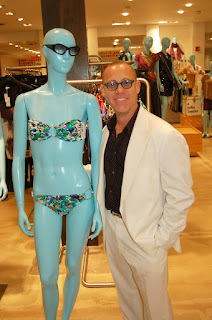 Photo: Designer Red Carter with his Carlos Betancourt bikini design at Barney's COOP.